What is the greyhound personality like? Greyhounds are very sweet and docile. They are friendly and form strong bonds with people. Do they really make good pets? They make wonderful pets and typically fit into a family easily. They demand little and are always ready to go along with the family activities. How long do they generally live? Greyhounds average lifespan is about 12-14 years. How old are they when they are no longer wanted for racing? Most dogs do not last the first season of racing and are finished at about age 2-3. Some go on for a couple of years more, but will be finished by age 5. How big are they? Males are usually between 26-30 inches high at the shoulder and weigh between 65-85 pounds. Females are 23-26 inches high and average between 50-65 pounds. Do they need a lot of exercise? No more than any other dog. Greyhounds are bred and trained to be sprinters. They are known as the 45 mile per hour couch potato. They may enjoy a short burst of energy followed by a long nap. If you have a fenced yard or a roomy house, a greyhound will have space to exercise and stretch his legs. A nice walk or two each day will also provide ample exercise. How fast do they run? A greyhound may reach 45 miles per hour within three strides. How are they with children? They are wonderful with children who respect dogs and know how to treat them properly. They are big dogs and although they are gentle dogs, they can get excited and may, in the process, unintentionally knock down a small child. 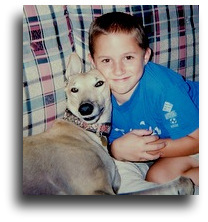 Know that greyhounds are not rough and tumble dogs with which a child should ride or wrestle. They do have a very playful spirit which families will discover. Just like any dog, some greyhounds will do better with children than others and we take this into consideration as we match dogs to their potential family. Can they live with cats? Yes! Some cannot live with cats at all, but most of them can live quite harmoniously with indoor cats. We do test our greyhounds for cat friendliness and foster them with cats when we can. Should you adopt, we will advise you regarding the introduction of your greyhound to your cat. How are they with other types of dogs? Although they have typically only lived with other racing greyhounds at the track, they can do just fine with other dogs big and small. Like people, it primarily depends on the personalities of the dogs. Some greyhounds may not be tolerant of little dogs. We do consider this as a part of their personality assessment. Do they shed? Very little. Greyhound coats are short and they lack an undercoat, therefore shedding is minimal and grooming is so easy. Just brush with your hands or a grooming mitt. Greyhounds do not have a “doggy” smell and, unless they have been playing in the mud, most people bathe their greyhounds twice a year. Are they hard to housebreak? Greyhounds spend most of their time in a crate at the track and are let out about 4-5 times each day to relieve themselves. They tend to be very clean and do not soil the area in which they live. They are considered crate-trained and know to do their business outside. In their adoptive home, they just need to be shown where to relieve themselves and taken out frequently in the beginning in order to establish good habits. They do learn very quickly and are eager to please. Do they have to be crated? 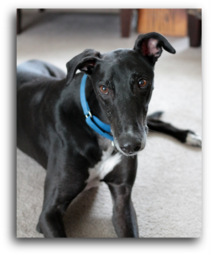 We recommend that adoptive families crate initially when their greyhound will be alone in the home. This will help to lessen any anxiety and keep both home and greyhound safe. Once the greyhound has settled in and is comfortable, he can be left out of the crate when alone if the family chooses to do so. MCGR foster families do crate their foster dogs when the family is away. Can they live in an apartment? Greyhounds make excellent apartment dogs because they are calm and quiet. Are greyhounds easy to train? Greyhounds learn quickly with positive reinforcement and gentile reminders. Do they need a coat in the winter? Because they have very little body fat and thin coats of fur, greyhounds do not tolerate temperature extremes very well. In Michigan, a greyhound will need a coat in the winter. What does it cost to adopt a greyhound from MCGR? The adoption fee for a racing greyhound is $275.00. For dogs age eight or older, the adoption fee is $150.00. For dogs received from China and for Spanish galgos and podencos the fee is $625.00 and $250.00 for dogs age eight and older. This fee helps us to defray some of our cost for the initial vetting as well as transportation expenses. Do they make good travel companions? Most greyhounds travel well in the car and love going places with their people. Do they make good therapy dogs? Yes! Because of their gentle nature and size they make wonderful therapy dogs. They stand calmly for petting and are tall enough to easily rest their heads on a lap or bed. Do they make good guard dogs? No. They are too friendly and quiet. What is a martingale collar? This type of collar was designed for sighthounds. Because of their narrow heads, buckle collars can easily slip off of a greyhound. The martingale is soft and comfortable. When in use it will snuggle up around the neck to prevent it from slipping off. Do greyhounds need to eat from raised bowls? There is a debate as to whether or not raised dishes affect the incident of bloat in dogs. Tall dogs may find a raised bowl more comfortable or medically necessary. We recommend that you seek the advice of your veterinarian for your particular dog. Can I take my greyhound off-leash? Only in a completely and soundly fenced-in area. By its nature, a sighthound may focus on and take off after something interesting in the far distance and become injured or lost. Never ever take a chance on unleashing your greyhound in an unfenced area. Can I jog with my greyhound? Greyhounds are sprinters and not endurance runners. They will certainly enjoy taking walks with you. Some may enjoy a short walk/jog, but, if you have an interested dog, you must slowly and carefully work to gradually build up his endurance for a longer distance. Have more questions? Give us a call at 1-855-624-7397.